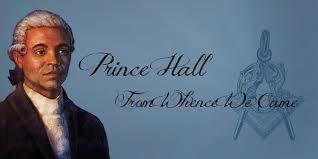 On March 6, 1775, Prince Hall and fourteen of his companions were admitted in an Irish Lodge #441 in Boston. There were fourteen military lodges in and around Boston in that year. Of these Lodges one was English, four were Scottish and the remainders were Irish. Lodge 441 was warranted on 4 July 1765 to meet in the 38th Regiment of Foot (1st Battalion South Staffordshire). When the Military Lodge left the area of Boston, and after the revolutionary war in 1783, Prince Hall and his Brethren reached out to England and were given the authority to meet as a Lodge, form Processions on Saints John’s Day, and conduct Masonic funerals, but not to confer degrees nor to do other Masonic work. These individuals later applied for and obtained a Warrant from the Grand Lodge of England in 1784 and were formed under the Grand Lodge of England as African Lodge #459. On February 16, 1812 (a significant date to Prince Hall Masons) the African Lodge of Boston, Massachusetts, issued a facsimile of their charter to a number of black Masons to establish a lodge in New York City under the name “African Lodge of New York”, later known as "Boyer Lodge of New York”. The name of the Lodge was later chosen in honor of Jean Pierre Boyer who black Masons admired and respected for his significant role in Haiti’s war of liberation from France. Thus, the year 1812 marked the beginning of “African American Freemasonry in the State of New York. On October 2nd, 1818, there appeared a notice in several local newspapers, calling for a meeting of a Lodge of Free and Accepted Masons and also on October 6th, 1818 in the City of New York, a lodge also styled, the "African Lodge". The notice was signed: Sandy Lattion, Worshipful Master of Boyer Lodge. Interestingly enough, just one day later, on October 7th, 1818, the White Grand Lodge of the State of New York called a special meeting, in what appeared to be an urgent meeting, to convene and investigate this matter. As a consequence, a Committee was appointed to investigate, and report back. This information was thunderous, since approximately ten thousand of the forty thousand Blacks in the State, were still under the yoke of the institutional of enslavement. This "incursion" into, "Their Territory and Fraternity", was a hard pill to swallow by many whites within our State when hearing of an established and operating Masonic Lodge composed of Free Black Men in New York City. What was forgotten is that prior to 1818, this Lodge was investigated on the 3rd of March, 1812, which was one month after its establishment. Also, after the 1818 hysteria, it was again investigated by the Grand Lodge of New York on March 4th, 1829. This report was submitted by Grand Secretary, James Herring of the Grand Lodge of New York on June 2nd, 1846 in there proceedings, which came from a letter from Charles W. Moore, Grand Secretary of the Grand Lodge of Massachusetts, which he stated that this, “...throws some light upon the condition of the African Lodge in Boston at this time”.